It is no surprise that Disney's Cinderella has made box office gold. Not only has the fashion world gotten into the hype (see Cinderella's shoes debut at Saks in New York here), but the media has been all a flutter with praise for the film. 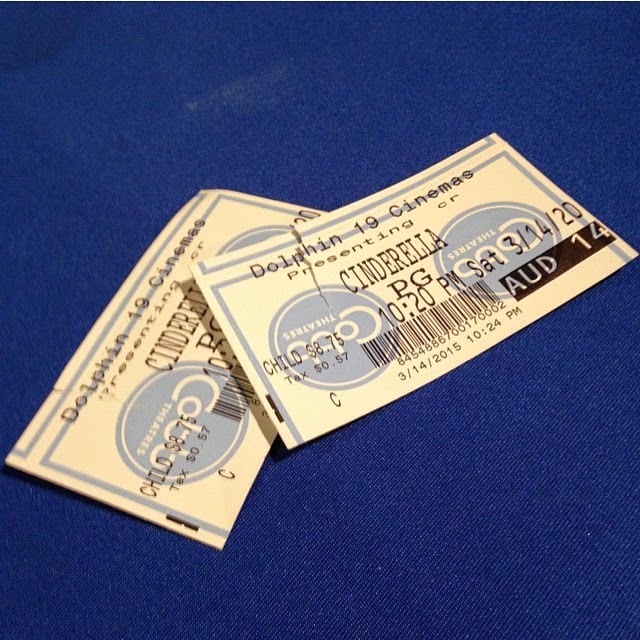 We definitely were out past midnight for our showing of Cinderella. I did my very best not to get overly excited about this film. I did not want to get my hopes up in case it was an epic failure. Disney had some high standards to live up to in adapting Cinderella! Before seeing the film, the only spoilers I allowed myself were those of the Disney Studios Live Action Panel at the 2013 D23 Convention. I was glad that they kept things tight lipped. We were treated to a video of Kenneth Branagh, detailing costume choices and giving an overview of the feel of the film. He expressed his joy in the casting of Lily James (Cinderella) and that's it! We viewed the film in a sold out theater. No surprise there. From beginning to end, the film felt like Disney had captured the essence of Cinderella in a bottle. I felt transported to a distant land where magic lives in small doses, Fairy Godmothers are real and dreams do come true. The film was rich in details. I couldn't help but get excited when I saw small homages to the Animated Classic created by camera paneling and small shots that mirrored the original. I was thrilled to see a nod to the original tale by the Grimm Brothers. At the very beginning, while her new step sisters ask for lavish gifts from his travels, Cinderella asks her father for a small token. The first branch that would knock his hat off on his way home. Truly, the film was a story book masterpiece that only Disney could pull off. As an added bonus, check out the side by side trailer created for the film and its animated counterpart. Have you seen Disney's Cinderella yet? What did you think of the live action retelling of the classic animated film?